Uses : Plant is bitter tonic, emetic, diuretic and purgative and useful in asthma, skin diseases and splenic enlargement. It is used internally for rheumatism, backache, internal hemorrhage, chest pains as well as hemorrhoids. Young fruit can be eaten raw like cucumber or cooked like squash, while the young leaves, shoots, flower buds, as well as the flowers can be eaten after being lightly steamed. The seeds can be roasted as a snack, or pressed to produce oil. Externally, it is used for shingles and boils. The dried fruit fibers are used as abrasive sponges in skin care, to remove dead skin and to stimulate the circulation. 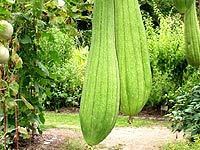 The fruits are anthelmintic, carminative, laxative, depurative, emollient, expectorant, tonic and galactagogue and are useful in fever, syphilis, tumours, bronchitis, splenopathy and leprosy. The vine is most commonly grown for the fibrous interior of the fruits. Kernel of seed is expectorant, demulcent and used in dysentery. Seed oil is used in leprosy and skin diseases. Fruit is intensely bitter and fibrous. It has purgative property and is used for dropsy, nephritis, chronic bronchitis and lung complaints. It is also applied to the body in putrid fevers and jaundice.